Trawden AC was founded by local legend Gerry McCabe, a runner who hailed from the North East and renowned for his race organisational prowess and down to earth humour. Gerry arrived in Colne in 1983 to take up a post as head teacher of Hendon Brook School. He joined Clayton-le-Moors Harriers early the following year, as at the time it was the biggest club in the area by far, and he had got to know Richard Lawson their secretary. In June 1985 Gerry organised his first race – the inaugural Hendon Brook Half Marathon – as a fundraiser for the school. There were only 65 runners in that first race mainly because there were three other races in Burnley and Pendle that same weekend. Gerry liaised with all the other local race organisers and by 1986 the Pendle & Burnley Grand Prix was born, initially with Clayton supporting the whole series. When Gerry's son David was 15 there were no school competitive sports as teachers were taking industrial action. He therefore decided to enter a team in the Accrington Saturday morning football league, and approached Trawden Celtic FC who agreed to allow his team to use their name and colours: black and white striped top, black shorts and red socks. Gerry wasn't too happy about these colours as he is a Sunderland man! By 1993 the Grand Prix was going strong and, although Gerry was still running for Clayton, he had become far more active with Trawden Celtic as a manager, secretary and gradually a player once again. In early 1993 he once again approached Clayton to support the Grand Prix but they refused to commit to the whole series, only those races they were fully organising themselves. This decision left Gerry with a dilemma as all races had to be supported by an official athletics club, which meant he would be unable to obtain race permits for all of the Grand Prix races. Without a permit there would be no race, and as Clayton was really the only club in the area he was facing a significant problem. However, Gerry was still very active with Trawden Celtic and they had a race in the GP: the Trawden 7. He proposed that they should become affiliated to the Athletics Association and as a result Trawden Celtic AC was born in 1993. Despite his footballing loyalties, Gerry styled the first running club kit on Trawden Celtic's colours, dispelling the myth that Trawden AC’s vest is based on the Newcastle football strip! Although a few Trawden Celtic footballers ran for the club (for example John Edmondson who still does), we had very few members and Gerry was regularly the only one in a race wearing a club vest. Essentially in its early days Trawden Celtic AC only existed to facilitate the Grand Prix. But by the late 1990s a few runners had come forward and asked to join, such as Clive McAfee and Antony Macro (who is still actively involved in the club) and so the membership slowly grew. 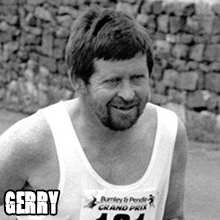 Gerry openly invited many unattached runners in the Grand Prix races to join Trawden, one of whom was Dave Croll. Around this time Molly Ralphson, her husband Dean and sister Fionnuala also signed up. These were all people who were keen to be actively involved in running the club. Trawden was now set to move on to another level. Gerry’s health was not as good as it had been, he had a growing number of grandchildren to keep him busy, plus he had almost completely stopped running. All of this meant that he was happy to stand down, although he was really excited about how far the club had progressed in such a short time. Around 1999 Trawden Celtic FC, a club which was founded back in 1966, very surprisingly folded. When this happened the committee at the time decided to drop "Celtic" from the club name and we officially became Trawden Athletic Club. In recent years Trawden AC has gone from strength to strength. From very humble beginnings 25 years ago we now have a thriving and diverse membership, including recreational runners, top level racers, ultra distance runners and triathletes. We have more happy members now than ever before and plus dedicated coaches, orienteering experts, road and fell runners who can offer advice and assistance. But the fundamental thing that sets Trawden apart from many other clubs remains: our all-inclusive, welcoming and above all sociable appeal. Being part of "Team TAC" is like being part of a wider family, where everyone is supported right to the finish, and there is always someone willing to go the extra mile to help.